I'm am used to eating braised eggs, but usually the Chinese style. 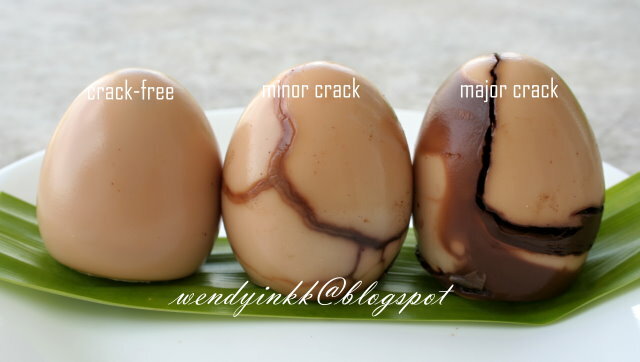 Tea eggs is one of my favourites. This is something similar but not the same. When I got to know about this dish, seeing the stuff I need to find, I was thinking to myself, "This is CRAZY". Where can I find such things? And the eggs are boiled for 3 days? But then... as I drove along the roads each day, I then noticed that almost everything is around me, except for the mangoesteen leaves. Then I asked my hubby's staff whether she has mangoesteen at home, and she told me she has a few trees right in her yard! And so, I have found all the leaves I need. If you look at the amount of stuff I gathered.... LOL. It's a lot! Actually I gathered too much. My pot could only accomodate this much but I gathered enough for almost 200 eggs. My kitchen patio was strewn with leaves everywhere. LOL. Galangal stalk- Staff's house but it's found in my neighbourhood too, just that I don't have the guts to ask. 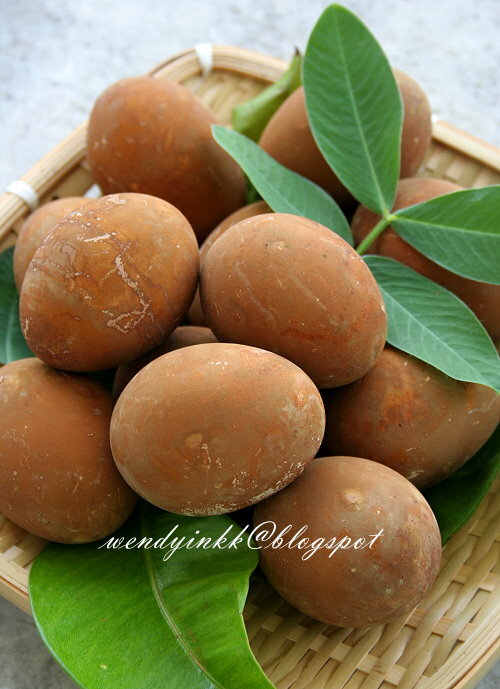 You can use other leaves like Noni, turmeric, coriander, Indonesian bay leaf, mint or any fragrant herbs, but the basic few should remain, as in the Mangoesteen, senduduk and guava as these 3 are believed to stain the eggs brown. Some even add chilli. Lots of variations on the internet. All prepared and ready to cook. I used only 1/3 of these, Too much of everything, LOL. I know you want to know how this egg taste like. My hubby's staff described it as the aroma of ginger braised chicken with soy sauce. Not bitter, nothing weird. 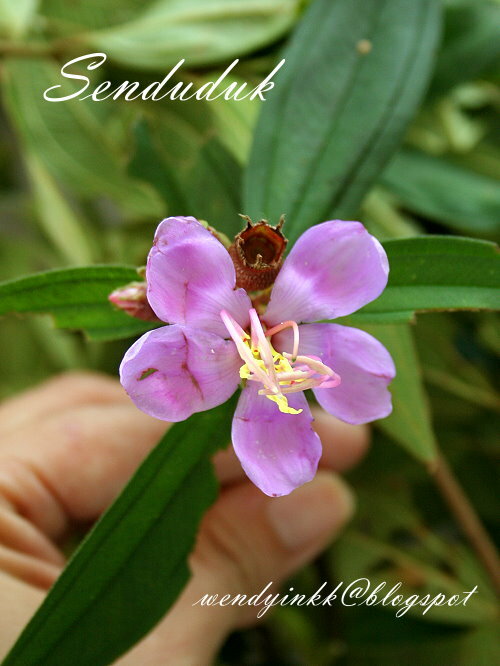 Just fragrant and savoury. 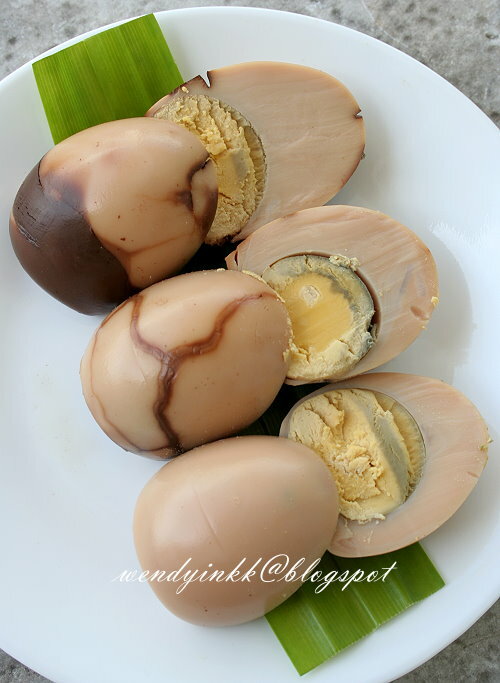 That staff had a bad experience with telur pindang that looked very very dark and tasted really astringent. He was quite scared to take his first bite, but after one egg, he asked for another. Even when the eggs are boiled for so long, you might think they taste like rubber. But no, they are not. The egg whites still taste tender. Which is kind of mind boggling, right? Tea eggs tastes more rubbery than these. It is said that the eggs will last 2 weeks at room temperature. It was not the same case with me. by the 4th day, the flavour diminished and 5th day, it tasted awkward. I thought it would keep, but it wasn't the case with me. Best kept chilled after the 2nd day if you want to keep it for a long time. If you were to read through the recipe, the 3 days boiling is actually not continuous. It's just for a few hours each day. But does it matter?? 3 days? First day: Colour on shell and egg white. Egg white is salty, but no aroma. 2nd day: Egg white has aroma but yolk is still like any other yolk. 3rd day: Flavour and aroma penetrates throughout the egg. So, it's ok to take the shortcut, but the flavour will be inferior. Some people say, boil the egg without the shell for quick penetration. hmm... Maybe I'll try that next time, but not this time, because I want to be CRAZY, LOL. 1. 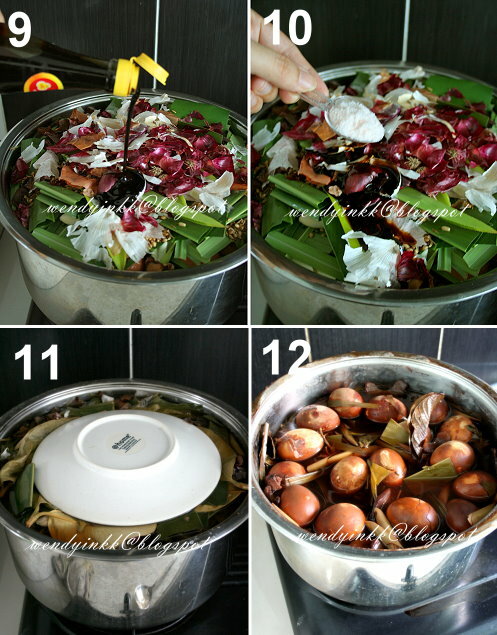 Rinse the leaves and tear/cut them into smaller sizes if needed. 3. 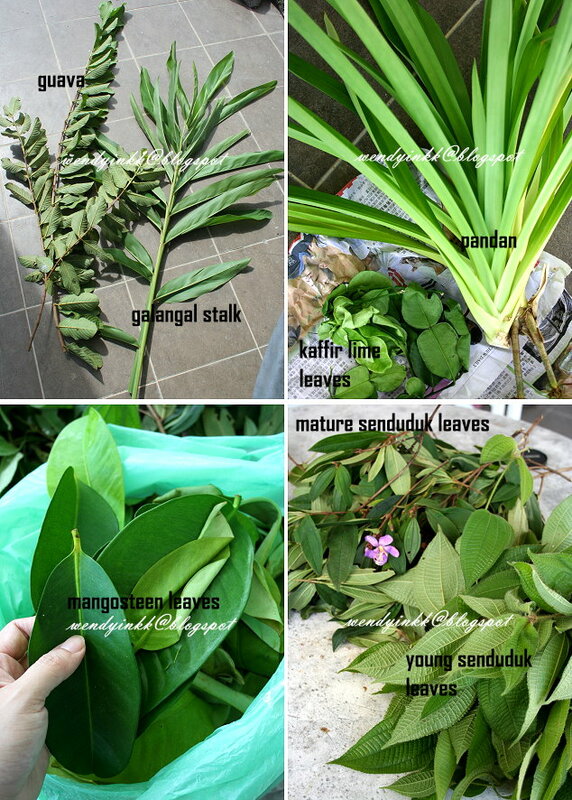 Arrange some of each leaves on the base of your pot. 4. 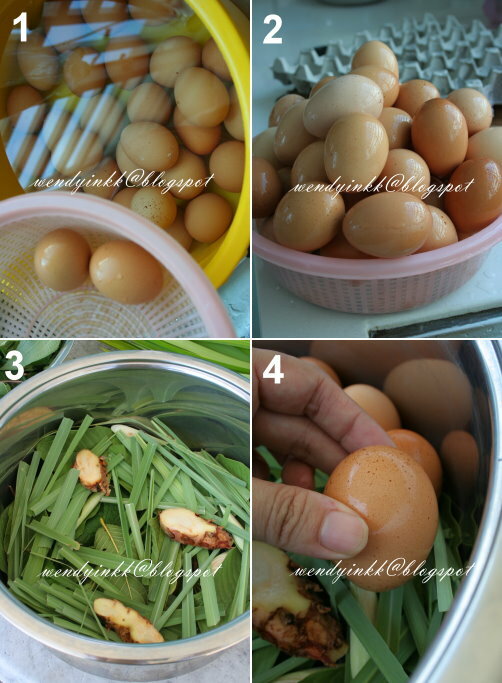 Arrange eggs onto the leaves. 5. Sprinkle the spices and skins over, and some asam. 6. Repeat with the leaves, eggs and spice layering. 7. 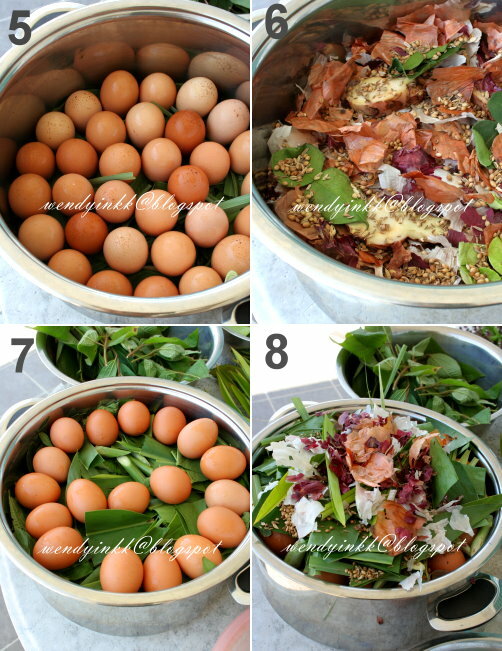 When the eggs are all arranged in the pot, cover with more leaves. 8. Put soy sauce and salt. Pour water over until it submerges all the eggs. 9. Place a plate on the top and bring to a boil. 10. Lower to a simmer for 4 hours. Turn off the heat. Let it rest. 11. The next day, bring it back to a boil and lower to a simmer for 3 hours. Turn off the heat and let it rest. Repeat this the next day too. 12. When the pot has totally cooled, fish out the eggs and wipe with kitchen paper towels. Egg is ready for distribution. Before I end this post, I'd like to express a big thank you to my dear reader Aishah Sazali who has helped me a lot as I prepared this egg. Her dad makes these eggs to sell and she is from Johor. Thank you Aishah. Oh my oh my.....a "crazy" recipe. First, with that loads of different leaves required, all those spices AND then have to boil for 3 days! Boiling each day for few hours, does the eggs anymore nutrition left? 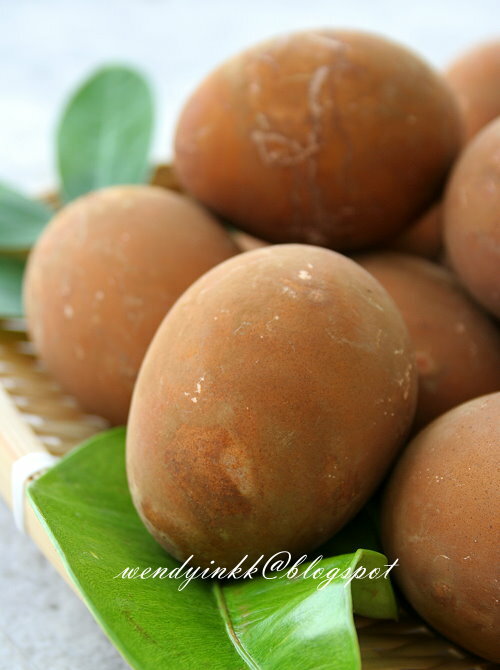 I think I eat my "herbal tea eggs better" lor..... But nevertheless, I have learned something in this post. Thank you Wendy! WOW! rajinnya u wendy.. sangat2 berusaha untuk mencari segala bahan2 yang banyak tu... tiba2 rasa teringin nak makan telur pindang... arrghh.. kena pegi kenduri kahwin di johor nampaknya.. hihi..
hahaha Wendy, salute la kat you! I pun tak berani nak try wlp I ni hantu telur pindang! boleh sapu 3 biji sekali duduk LOL! and you rebus 50 biji? ada lagi tak? Wow Wendy, hats off to you for going round collecting all the different leaves and then cooking the eggs! Waa, 3 days! and so many thinks to do! No way just to eat eggs lol, even though I do love eggs! Didn't know it took so much effort to make these eggs! Hats off for the effort and thanks for sharing! So much effort, must sell the egg for like 5ringgit each! I've never seen such eggs. Not really, less pungent. Smells more mellow, but on the gingery side. The simply way, is adding tea bag on your recipe. This tea will make your egg brownies. Beautifully detailed project, Wendy. I would be hard pressed to find the mangosteen leaves in the US but am inspired to give it a try. Followed the link in MNGG on Senduduk query to here. All those herbs etc - must have been an aromatic concoction. Yeah, mangoesteen will be hard to get there. It's purpose is only for colouring. You can skip it if you can't get it. 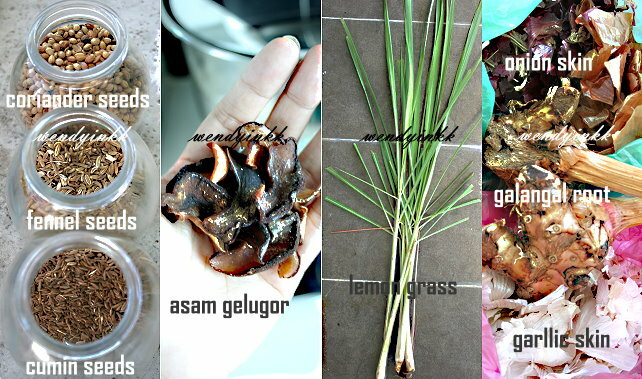 As for galangal fronds, you can skip it if you can't get it, the roots will be sufficient. Hello Wendy, I am Eve from Ochre Pictures. We are currently producing a documentary drama for Suria called Demi Cinta. 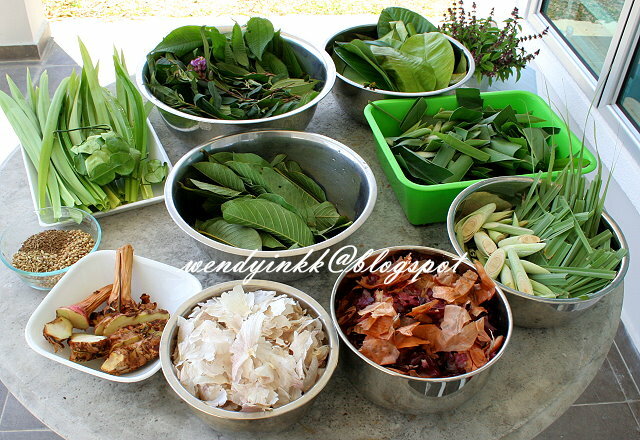 Our show is about the preparation of Malay wedding. 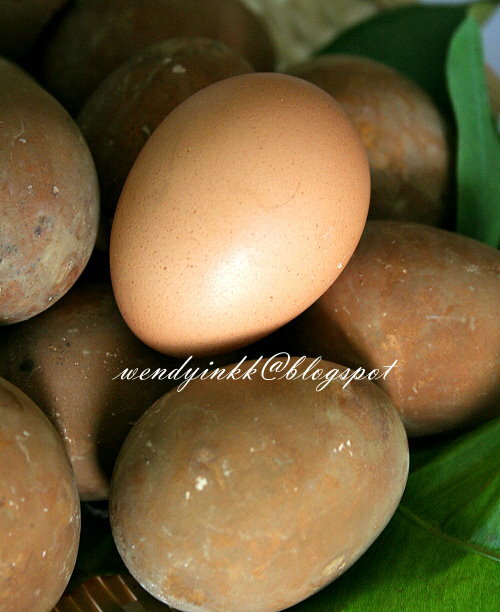 We are looking for some "telur pindang" photo for our show. It will be only 2-3 sec show time. We came across your blog and we are enjoying to read your topic. We would really appreciate if you can allow us to use your photos for our show. Your name/blogger title will be credited in our roller credits list. Wah you made a lot of effort to make telur pindang. I saw youtube videos how to make telur pindang decorated with polka dots, hearts and leaf pattern. But they cooked it for 3 hours instead of 3 days. my late mom used to prepare this egg for all the weddings in my house.. now that she's gone, no one ever tries to do this anymore in my family.. maybe I will try to revive this tradition in my family back again.. thanks for the recipe! sedap gilerrrrrr telur ni..